The last four days have seen WTI Crude prices plunge almost 10% from their cycle peak near $73 to a $65 handle overnight. This is the longest run of losses in almost four months as Saudi Arabia and Russia said they are discussing raising output to ease consumer anxiety after prices jumped to levels last seen in 2014. Saudi Arabia and Russia signaled they’ll restore some of the output they cut as part of a deal between OPEC and its allies that took effect in January last year. Potential opposition from several producers could complicate the group’s effort to reach a consensus when it meets next month in Vienna. After the $115 peak in 2011, oil ranged between $115 and $75 for 30 months. 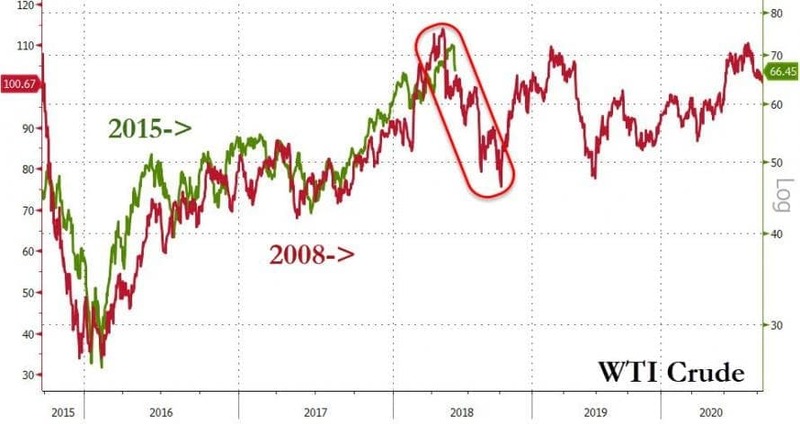 A similar dynamic this time would suggest a $70 to $50 multi-year range... which fits with what Russian President Vladimir Putin said last week - that oil prices at $60 fully suit Russia and the country doesn’t want them to spiral higher. Anything above that level “can lead to certain problems for consumers, which also isn’t good for producers,” he said. OPEC and his nation don’t plan to stick to existing output cuts, he said. 5. require further increases in production in 2019, which will further reduce already limited spare capacity next year. Despite greater clarity on the OPEC/Russia response function, today's headlines by no means suggest the oil market is on a smooth path to rebalancing. Instead, the current level of the market deficit, the robustness of the demand backdrop, and the rising levels of disruptions all set the stage for inventories to fall further all the while OPEC spare capacity is drawn down. As a result, even if today's headlines provide a cap on prices in the short term, we reiterate our $82.5/bbl 3Q18 Brent price forecast (which effectively embedded such a supply response) and still see risks to prices in 2H18-2019 as skewed to further upside. In fact, history shows that increases in OPEC production quotas in a strong demand environment (like today) are followed by higher prices in the subsequent months. 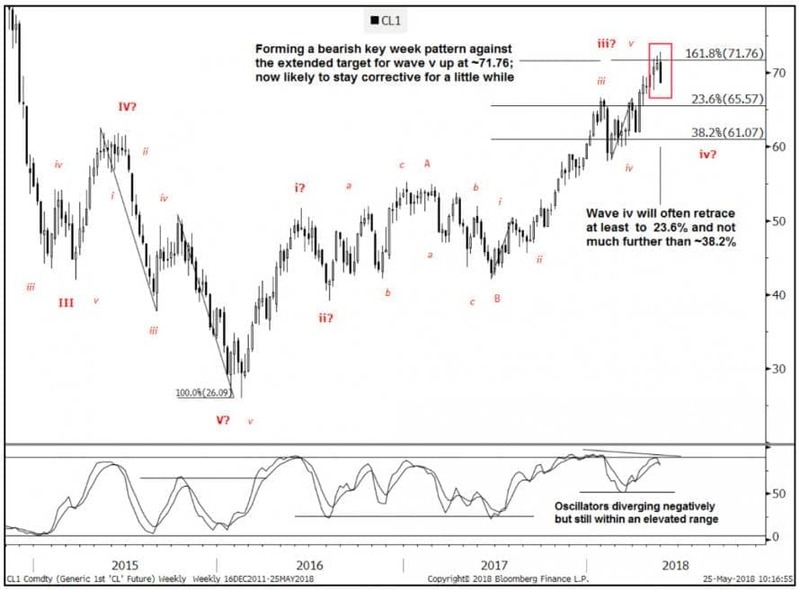 This 71.76 level was the target for a 5th of 5-waves from Jun. ‘17 lows. It’s since posted a bearish key weekly reversal against negatively diverging oscillators. The market hasn’t posted one of these patterns (from a local high) since ‘13. 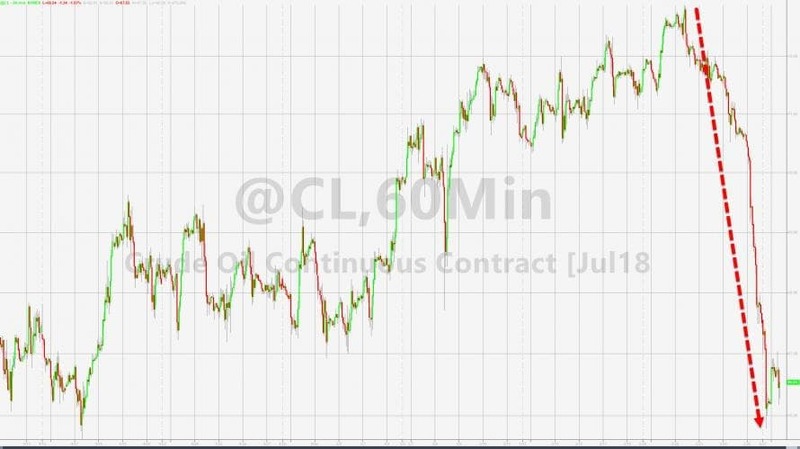 A short-term top is likely in place, it could take some before WTI is able to resume its uptrend. Wedges are classic ending patterns that often result in sharp/impulsive breakouts. The breakout thus far has been pretty textbook. The next congestion area to note is 66.8066.31; includes 23.6% from the Jun. ‘17 low. The wedge itself suggests potential to retrace the full extent of its ascent to 61.73, near 38.2% retrace 62.23. 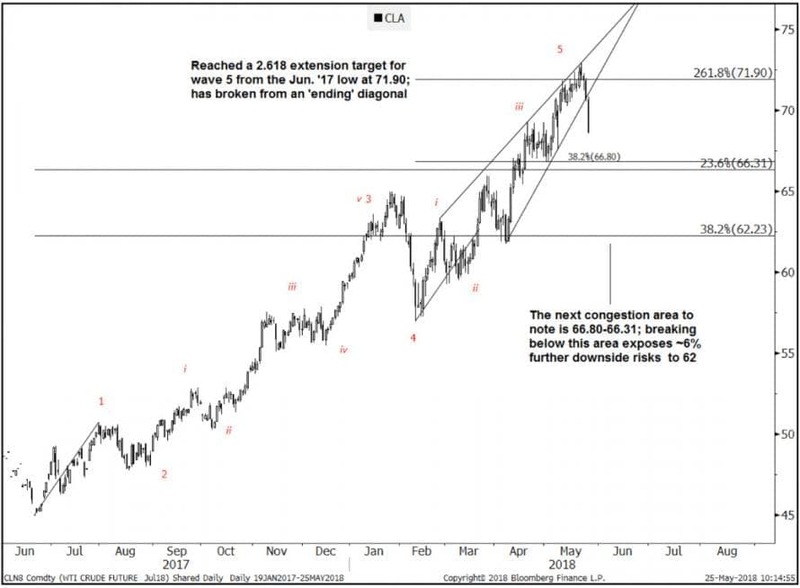 View: Next congestion area below 66.80-66.31. Scope to retrace as much as 62.23-61.73.